More than 200 guests from the UK and overseas attended a Topping Out ceremony at Royal Albert Dock, east London on 12th April 2018 to mark construction of the first phase of the £1.7 billion development project reaching full height. The development of Phase One, on course for completion in March 2019, only began in April last year. Set across eight acres, it will deliver approximately 635,000 sq ft GIA of commercial office space in two general design typologies, with accompanying retail space and a high quality urban realm. “We did what we promised which was to push on with construction of our first phase. We have been fortunate to receive wide support from across the UK and from Chinese business and political communities in these projects, their presence today further affirms this close relationship and we look forward to strengthening our ties with all parties involved going forward,” said ABP Chairman Xu Weiping. Coinciding with the ceremony, Strawberry Star Group, London-based international property company, which committed to purchase five Grade A office buildings in Phase One in November 2017, completed the sale transaction of a third building – building 11 – this week (9th April 2018). The company had exchanged contracts for the first two buildings in December last year. John Miu, Chief Operating Officer at ABP London, added: “Companies choosing to locate in Royal Albert Dock will be well positioned to capitalise on the increasing number of talented and skilled people moving into east London as well as business opportunities in knowledge-intensive sectors such as media, fashion, fintech, as well as legal services and bio-pharmaceuticals. The principal contractor, CITIC Construction, and principal sub-contractor, Multiplex Construction Europe, have utilised a number of off-site fabrication methods to ensure the on-site construction sequencing and works at Royal Albert Dock progress as quickly as possible. 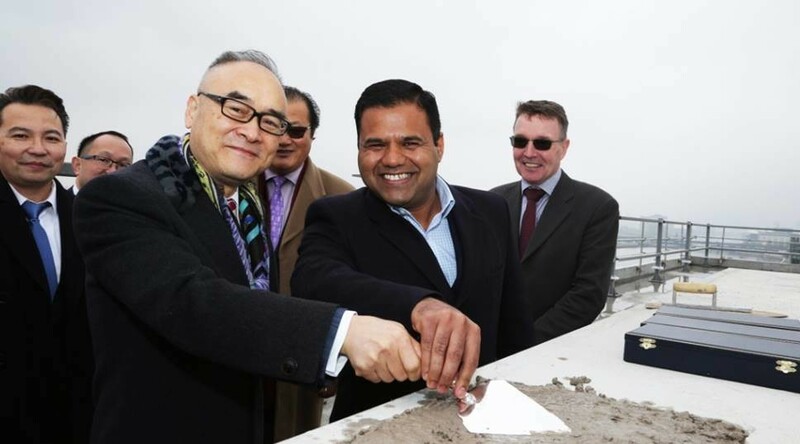 Andrew Broomfield, Chairman (UK & Europe) at WT Partnership said “We were delighted to attend the topping out ceremony for Phase 1 of ABP’s elegant regeneration project at the Royal Albert Dock. This is a significant milestone and having been involved with the project since late 2010, it is heartening indeed to see the first physical manifestation of Mr Xu’s dynamic vision for the site. It has taken a truly significant effort to get the development to this stage and we would wish to congratulate all the team members, stakeholders, partners and colleagues for their dedication, commitment and belief in this project. WT Partnership is delighted to be providing Employer’s Representative and Cost Management services.